During a lay day in the calm waters off Rote, an island found at the Southern tip of Indonesia, Cody Young was fiercely reeling a fishing pole as an Aku battled back on the other end. Suddenly, everyone on the boat changed their cheers to yells: “Turn it over, turn the reel over!” With a laugh, Cody flipped the pole 180 degrees and continued reeling, eventually pulling the Aku into the boat with a smile. What Cody already has the hang of is the competitive grind of surfing. 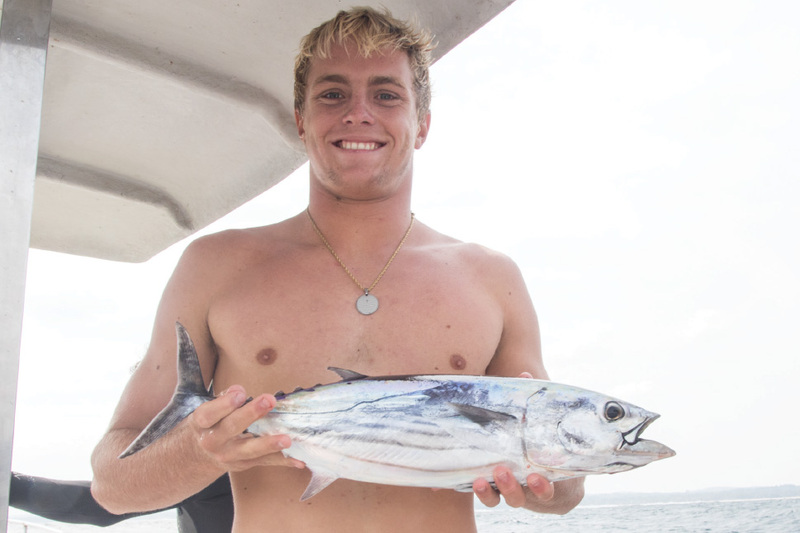 The 18-year-old Maui native won his first National title at the NSSA Championships in 2016, finished runner up at the same event this year, and also had a semifinal finish at the WSL World Junior Championships in January. Under the tutelage of Freddy Patacchia, and surrounding himself with the talented Quiksilver team, Cody is continuing to learn and train, hoping to finish strong on the Qualifying Series this year, aiming to achieve his lifelong dream: to compete on the Championship Tour. What was it like growing up on Maui, Cody? Growing up in Maui was amazing! I couldn’t have asked for a better place to be born and raised. My best memories from my true grommet days are from being down at the pavilions at Ho’okipa all day long with my friends. Whether we were surfing, fishing, or jumping off rocks, we always had fun. What was your first surfing competition, and what did you like about surfing competitively? I got into competing fairly late compared to the kids these days. My first contest was at Ho’okipa when I was 9-years-old. I sat on the inside left and caught whitewater. In the first few years, I liked competing because all my friends did it, but the older I became, I realized I loved trying to better myself each and every heat. Who were some of the Maui boys you looked up to growing up? I watched every Maui guy from Nalu Wallace to Ian Walsh and Albee Layer really closely. I look up to all these guys and more because I’m constantly inspired by their drive. They’re also good role models. Talk to us about surfing alongside your little brother, Levi. In a recent interview, he called you his “biggest inspiration.” Do you ever give him tips? I give my little brother tips all the time, and depending on his mood, he usually listens and tries to do what I tell him. What are your surfing goals, and how do you plan on reaching those goals? My main goal is to qualify for the CT. To do that, I have to work hard, stay focused, and always give it 100%, but most of all, I’ll make sure I’m always having fun doing it. What’s it been like working with Freddy Patacchia through the Quiksilver team? It’s been really cool to work with and get to know Fred. He’s obviously got so much experience and a lot to teach, and the main thing I learned from him is what it takes to get to the top. That and how to surf a heat. You’ve spent many summers on the road traveling, so what are your board bag travel tips from your experiences? I’ve learned to cover your boards with your wetsuits on the tail and the front, so if they drop it on the tail, then you at least have a little padding there. What are your 5 travel essentials? Neck pillow, Bose headphones, phone, computer, and downloaded TV shows so I can watch it on the plane. What are your plans now that high school is in the rear view mirror? For the rest of 2017, I’d like to finish well on the Qualifying Series and win World Juniors. Along with that, I want to continue to work with both Therasurf and Surfers Healing to help kids with special needs surf. I plan on organizing another event soon and making it an annual thing.